This is the place for flashpackers to stay at Ninh Chu Beach. Located beside Minh Duc Guesthouse and 50 metres from the beach, Huong Bien Guesthouse offers clean and well done up modern rooms. This means high ceilings, large windows, beds with bedside table and electrical plug, pot lights, air-con and WiFi. Extra flashy comforts include fridge, flatscreen TV, desk, cheery solid pine furniture and a spacious ensuite bathroom with a separate shower area, a dam on the floor to prevent most of the water from soaking the bathroom floor. Some rooms have a private balcony, the ocean visible on the higher floors. Some English is spoken, and if you need bus, train or motorbike rentals, Minh Duc is right next door. The English speaking owner at Minh Duc can book transport for you for a small fee. Overall, Huong Bien is recommended. Last updated on 29th April, 2016. 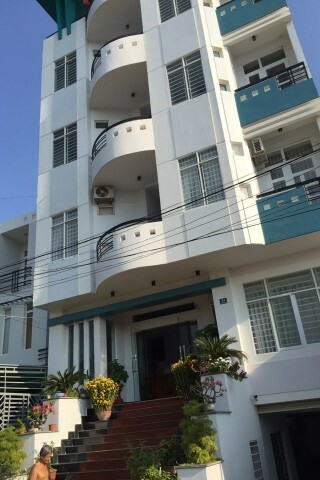 Check rates at Huong Bien Guest House on Booking.com.